In the early years of the 1700s, at the end of the reign of Louis XIV (who dies in 1715), there was a shift away from the classicism and “Grand Manner” (based on the art of Poussin) that had governed the art of the preceding 50 years in France, toward a new style that we call Rococo. The Palace of Versailles (a royal chateau that was the center of political power) was abandoned by the aristocracy, who once again took up residence in Paris. A shift away from the monarchy, toward the aristocracy characterizes the art of this period. What kind of lifestyle did the aristocracy lead? Remember that the aristocracy had enormous political power as well as enormous wealth. Many chose leisure as a pursuit and became involved themselves in romantic intrigues. 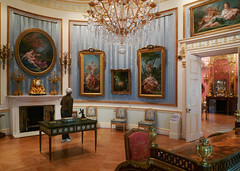 Indeed, they created a culture of luxury and excess that formed a stark contrast to the lives of most people in France. 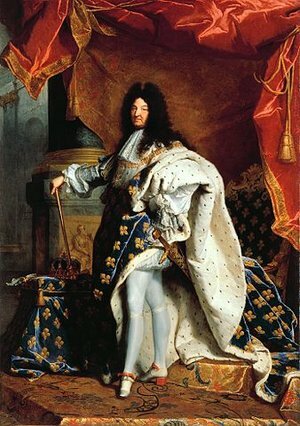 The aristocracy—only a small percentage of the population of France—owned over 90% of its wealth. A small, but growing middle class will not sit still with this for long (remember the French Revolution of 1789). 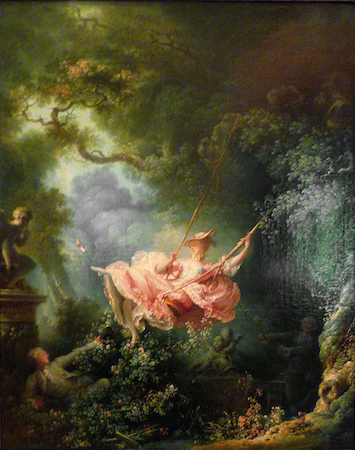 As with most Rococo paintings, the subject of Fragonard’s The Swing is not very complicated. 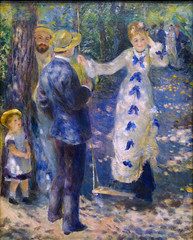 Two lovers have conspired to get an older fellow to push the young lady in the swing while her lover hides in the bushes. Their idea is that—as she goes up in the swing, she can part her legs, and her lover can get a tantalizing view up her skirt. The figures are surrounded by a lush, overgrown garden. A sculptured figure to the left puts his fingers to his mouth, as though saying “hush,” while another sculpture in the background shows two cupid figures cuddled together. The colors are pastel pale pinks and greens, and although we have a sense of movement and a prominent diagonal line—the painting lacks the seriousness of a baroque painting. If you look closely you can see the loose brushstrokes in the pink silk dress—and as she opens her legs, we get a glimpse of her stockings and garter belt. It was precisely this kind of painting that the philosophers of the Enlightenment were soon to condemn. They demanded a new style of art, one that showed an example of moral behavior, of human beings at their most noble. 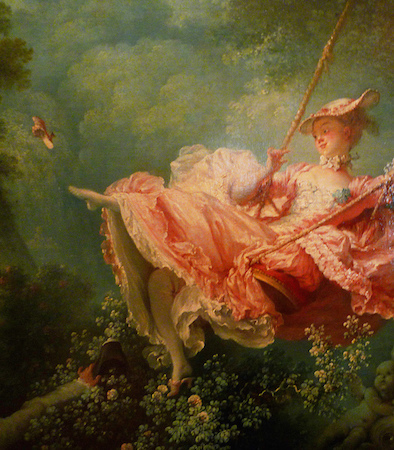 Cite this page as: Dr. Steven Zucker and Dr. Beth Harris, "A beginner’s guide to Rococo art," in Smarthistory, January 7, 2016, accessed April 20, 2019, https://smarthistory.org/a-beginners-guide-to-rococo-art/.